The McElroy family has lived in Washington County about as long as there has been a Washington County. 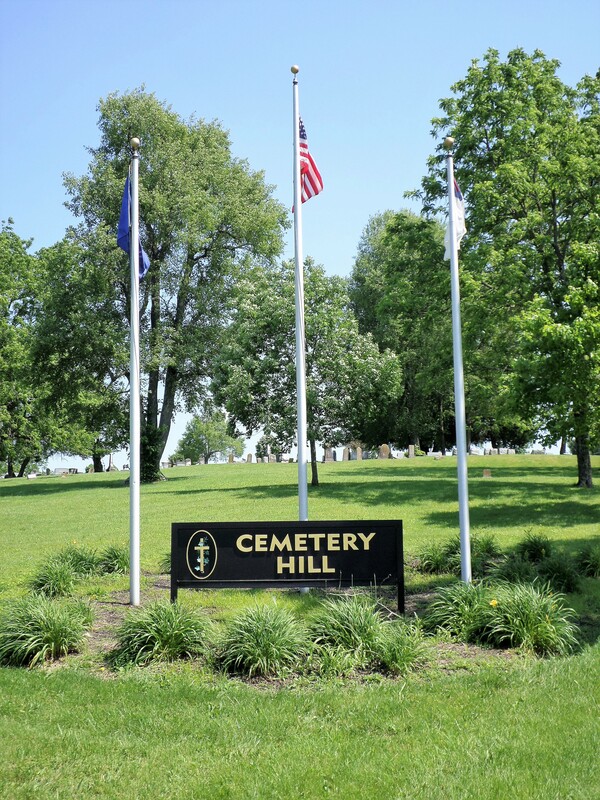 Many members of the family are buried in Cemetery Hill – name of the city cemetery for the town of Springfield. 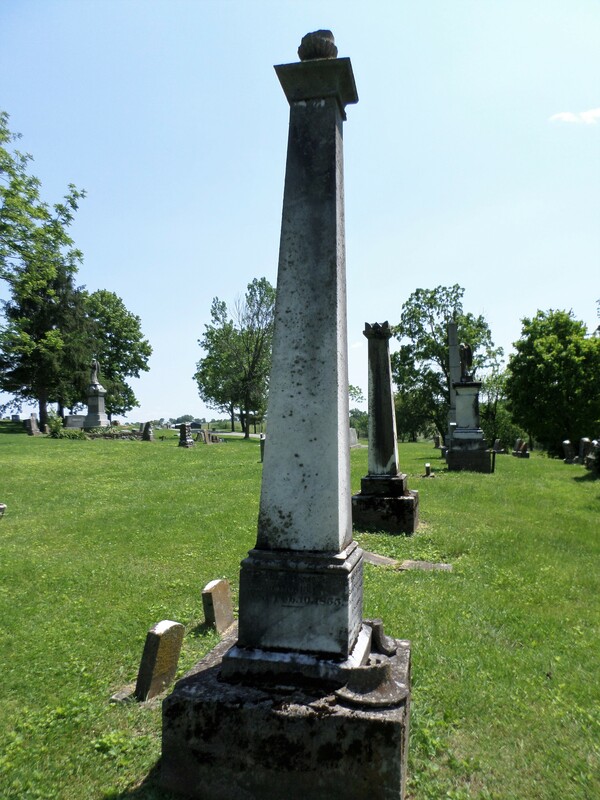 Many of my mother’s family are buried here – those relations who did not attend the two Catholic churches in the area – St. Rose and St. Dominic. Those long-dead relatives are rightly buried in the cemetery of their respective church. About 1788 Hugh McElroy, Sr., with two younger brothers, Samuel and James, moved from Campbell County, Virginia, to what would become Washington County, Kentucky. The McElroy’s of the county sprang from the descendants of these three brothers. As part of the family settled in the part of the county which became Marion County, you can see they were spread throughout the area. Four children of Hugh McElroy, Sr., and Nancy Esther Irvine, his wife, are remembered by one gravestone in Cemetery Hill. John McElroy, married Mary Hundley, November 6, 1794. James McElroy married Rosanna Hardin the same day. Abraham McElroy married Disey Hundley, May 27, 1802. Elizabeth McElroy never married. 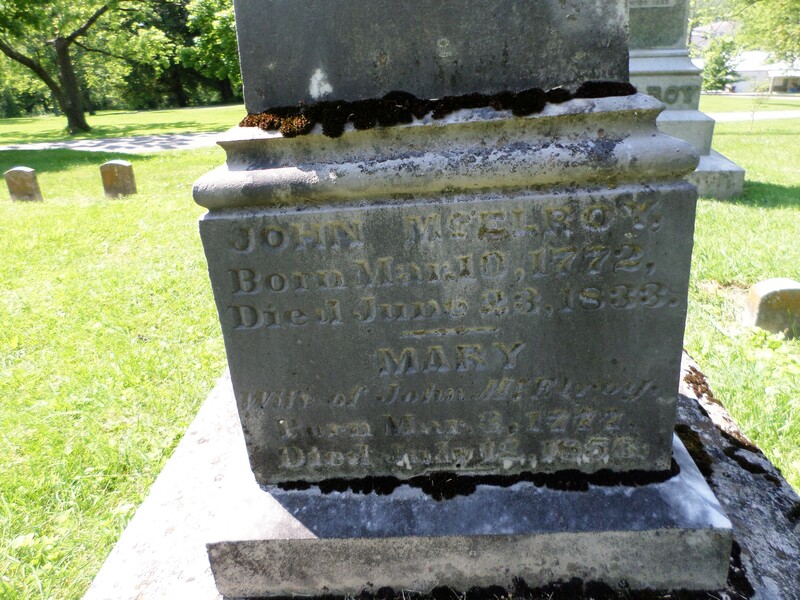 John McElroy, born March 10, 1772, died June 23, 1833. Mary, wife of John McElroy, born March 3, 1777, died July 12, 1856. 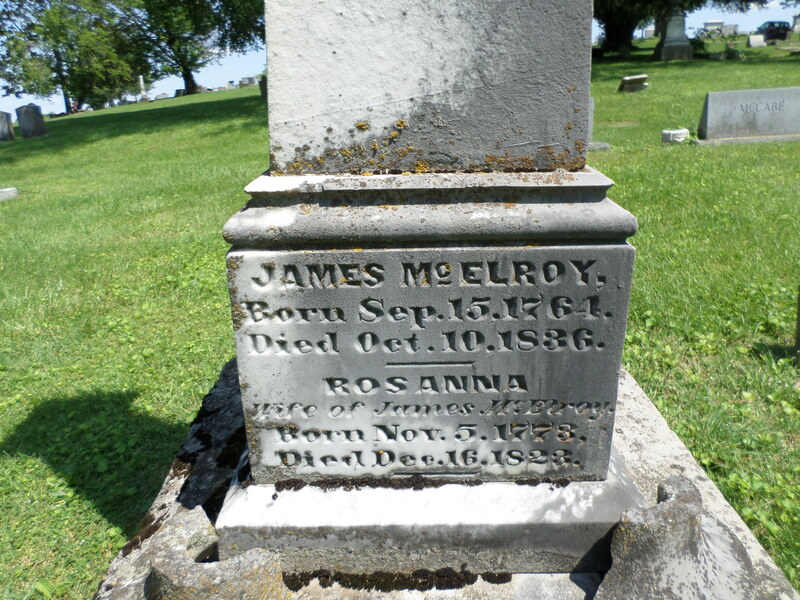 James McElroy, born September 15, 1764, died October 10, 1836. 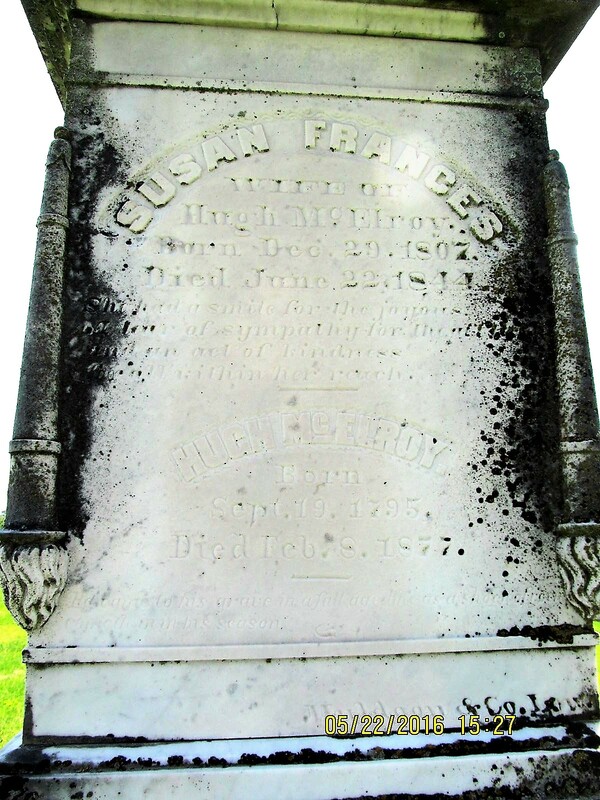 Rosanna, wife of James McElroy, born November 5, 1773, died December 16, 1822. 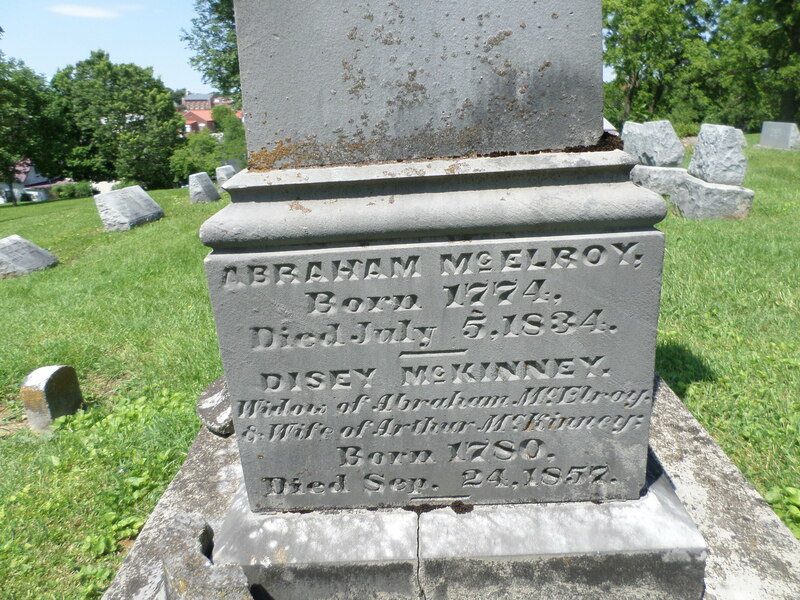 Abraham McElroy, born 1774, died July 5, 1834. 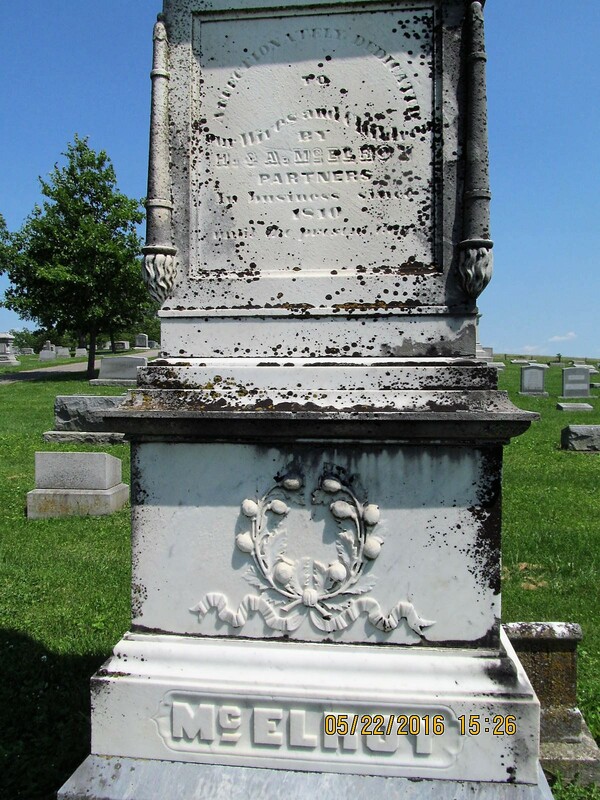 Disey McKinney, widow of Abraham McElroy and wife of Arthur McKinney, born 1780, died September 24, 1857. 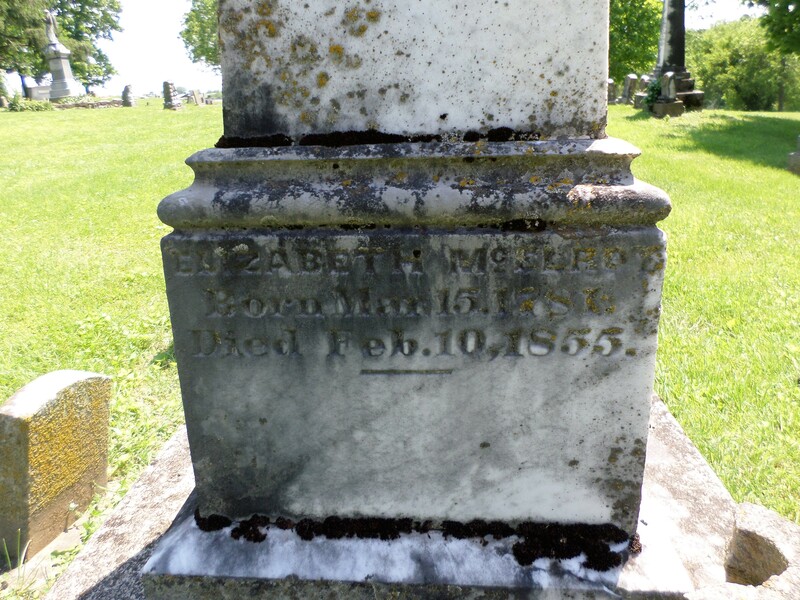 Elizabeth McElroy, born March 15, 1787, died February 10, 1855. Three children of John and Mary McElroy are also buried in this cemetery. Hugh McElroy married Susan Cocke, June 6, 1826. Anthony McElroy married Ann Garland Rice, November 25, 1824. Sallie McElroy married John Crawford, March 10, 1817. Brothers Hugh and Anthony were also partners in a merchandising business for many years in Springfield, under the name H & A McElroy. Affectionately dedicated to our wives and children by H. & A. McElroy, Partners in business since 1810 until the present day. 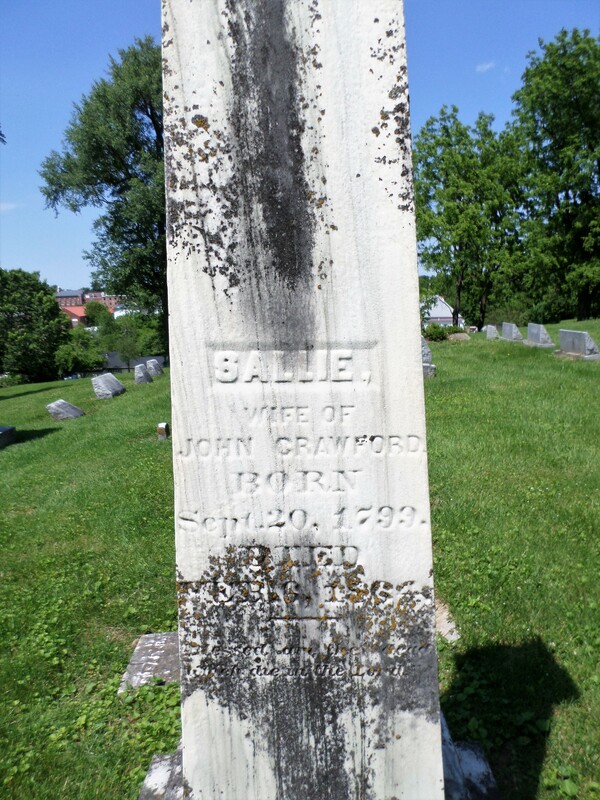 Sallie, wife of John Crawford, born September 20,1799, died February 6, 1864. 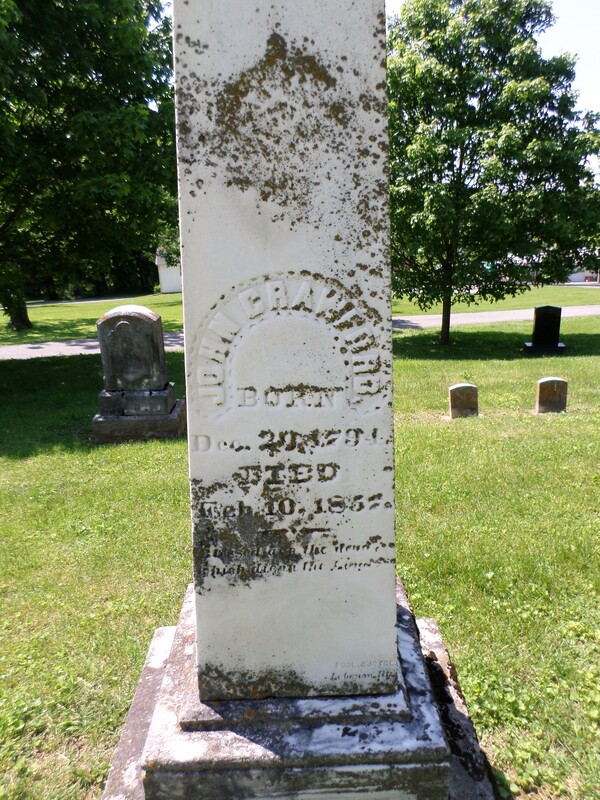 John Crawford, born December 20, 1794, died February 10, 1857. 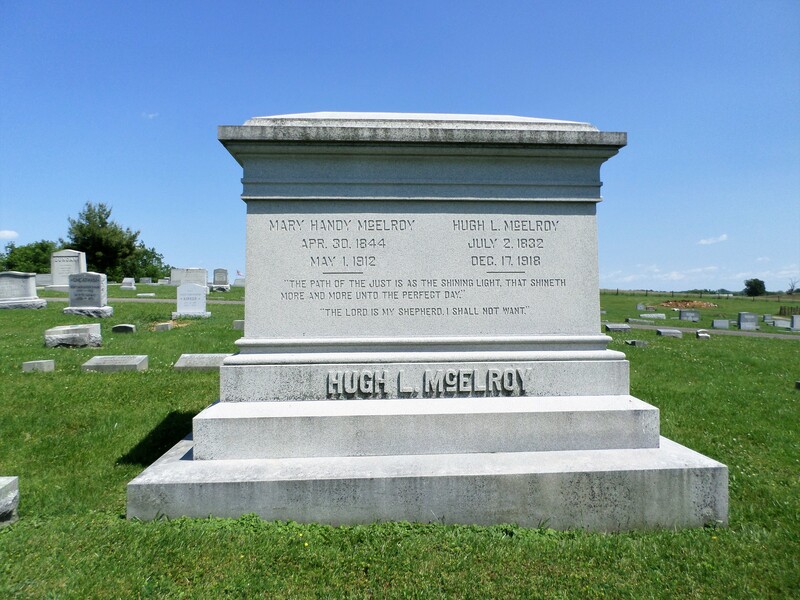 Hugh L. McElroy, July 2, 1832 – December 17, 1918. 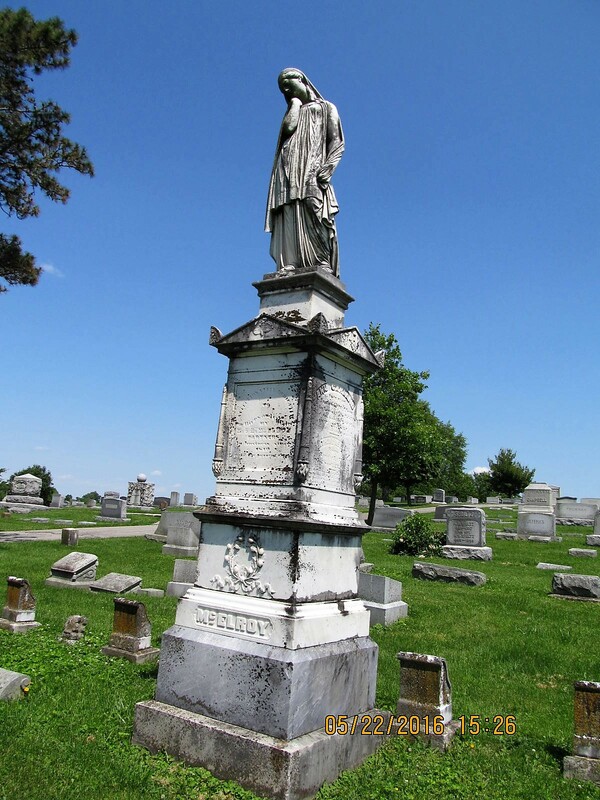 Mary Handy McElroy, April 30, 1844 – May 1, 1912. Hugh L. McElroy is a son of Anthony and Ann. 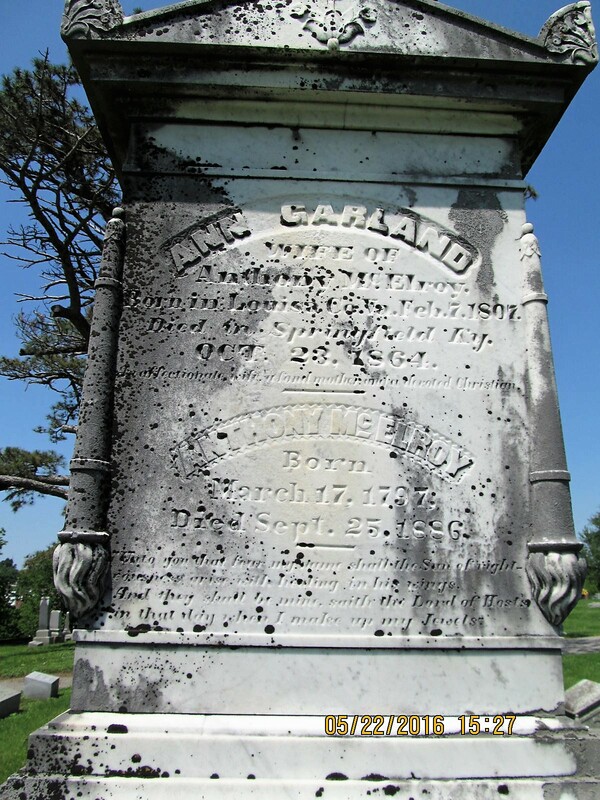 My thanks for your Cemetery Hill information on the McElroy family!